March 17 is St. Patrick’s Day, the national day of Ireland. St. Patrick’s Day is celebrated all over the world, including in Brussels. This year the Grand Place will be lit entirely in green as part of the Global Greening initiative of Tourism Ireland. 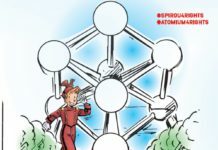 The launch of this ‘greening ‘ in Brussels will take place on Sunday 16th March in the presence of the Irish Minister for European Affairs Mr. Pashal Donohoe T.D. and the Ambassador of Ireland to the Kingdom of Belgium H.E. Eamonn Mac Aodha. Manneken Pis will also join in the celebrations – he will be dressed in a traditional Irish outfit at 17h30 on Sunday March 16, at an official unveiling ceremony. 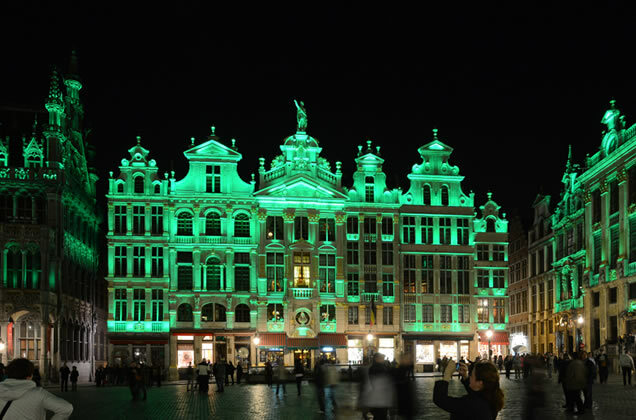 At 19h20 on the same day, the entire Brussels Grand Place will be lit in green. The following day, on St. Patrick’s Day, Manneken Pis will once again wear his Irish outfit, and the Grand Place will be greened once more from 19h20. Everyone is welcome to come see the St. Patrick’s Day sites on both days. An increasing number of global iconic landmarks are taking part each year. Landmarks such as Niagara Falls, the leaning tower of Pisa, Sydney Opera House, and Table Mountain in South Africa will once again be greened for St. Patrick’s Day. Other new sites going green for the first time in 2014 include Canada’s famous ski resort of Whistler; one of the highest waterfalls in Europe, the Rhine Falls near Zurich; the distinctive Evoluon Eindhoven in the Netherlands; the Trump International Hotel & Tower; four iconic skyscrapers in Philadelphia; Kaprun Castle in Zell-am-See and the Skiwelt Söll (ski resort), both in Austria; the Petrín Lookout Tower in Prague; and the Taj Mahal Palace hotel in Mumbai, India. And there’s a fairytale ending for St Patrick’s Day this year, as Sleeping Beauty’s Castle at Disneyland® Paris also goes green.